Innovative, sturdy and practical – both the MS531B and MS533B are a musicians' and roadies' dream come true. Just like I was impressed with the amount of innovation that Hercules have put into their guitar stands (reviewed here) I am impressed with what they have done with the traditional mic stand design. In this case we reviewed two items – the MS531B and MS533B. As you can see, these are essentially very similar with the notable difference of the 533B having an innovative hideaway boom design and no counterweight. Both stands are built from sturdy die cast aluminum which ensures confidence. Other time saving innovations not found in other mic stands that are notable on these two are the Quik-N-EZ Adaptors, Boom Retainer and Clutch. Just as the Hercules guitar stands, these mic stands are a roadie's dream come true. There are so many time saving innovations that could instantly reduce a gigging band's setup time. Both stands are sturdy and balance securely on the stage. Compared to the budget stands that most clubs use – these feel a little sturdier and bulkier, yet lighter. The legs also spread out a bit further due to the tripod base design. All the innovations work as advertised. 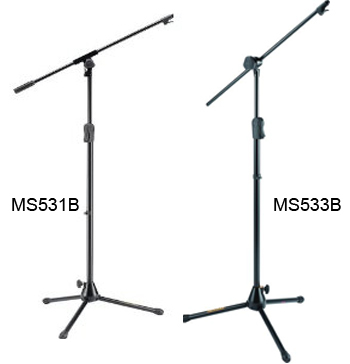 The MS533B is especially interesting as it has a hideaway boom design which lets you convert it to either straight up vocal stand or a boom stand. The boom fold basically hides into the mic stand design in such an ingenious way that is quick and easy to set up. The downside to this design is that there is no room for counterbalance, so in the case of some heavy mics it could tip forward, in which case the MS531B would be a better choice. The Quik-N-EZ Adaptor is a great tool for attaching mics on the quick as now you can screw down one on each of your mic clips (the stands come with 2 each) and when you need to attach a mic clip it is only just a single snap. The 2-in-1 Boom Clamp lets you adjust the length and the angle of each stand at the same time, again with one movement, a feature that comes in especially handy when you're in the middle of a set. The Quik-N-EZ Boom Retainer lets you attach the boom with one single click, which is also quite handy when you're on the road. All these little innovations save up big in setup/tear down time which could add up, especially if you're on the road. This is another line of impressive products by Hercules which I can wholeheartedly recommend to any musician.